Luxury and capability blend perfectly in this small luxury SUV from Range Rover. The 2018 Range Rover Velar emphasizes refined styling and innovative features to create an SUV you will be proud to own. There are a variety of features aimed at comfort, safety, and entertainment. The 10-way adjustable seats have 8 power and 2 manual adjustments. The Two-Zone Climate Control System allows you to set separate temperatures for the comfort of driver and front seat passenger. You can enjoy your favorite music on the 250W 8-speaker sound system. The Velar features eye-catching 18″ 15-spoke Sparkle Silver wheels with Land Rover logos. There are plenty of safety features too. 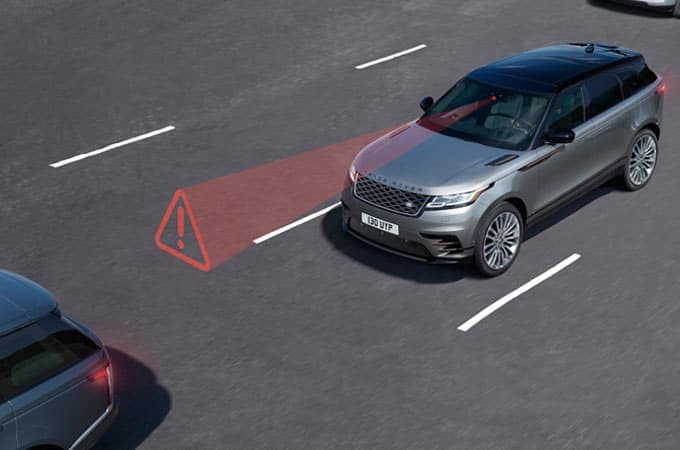 The Autonomous Emergency Braking System gives a warning to allow the driver to take action if a potential collision is detected. The Lane Departure Warning System will sense if the vehicle is drifting into another lane and provide a visual alert and gentle vibration of steering wheel. It’s the perfect time to enjoy the luxury and capability of the 2018 Range Rover Velar. Visit Land Rover Colorado Springs today for a test drive. Our Land Rover experts would like to introduce you to the many features that will give you a comfortable drive every time.